Experience the jungle like Tarzan!!! The Ultimate adventure is available nowhere else in the world. Allow yourself to soar like a bird above the jungle canopy, then swoop down into the mysterious beauty of the cenotes. Choose your own speed as you pedal over a spectacular jungle vista. Then, pause at the midpoint of the one-kilometer circuit to refresh yourself in the waters of Tak Bi Luum (The Hidden Worlds) cenote, donning snorkel gear to explore the delicate wonders beneath the jungle floor. Pick up time whenever you wish. Unlimited access...do each activity as many times as you like! 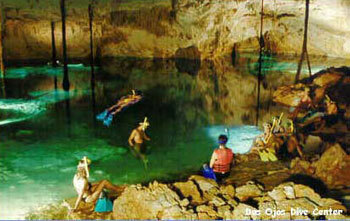 Ultimate Adventure includes Jungle Zip-Line, SkyCycle, Cenote Splashdown Zip-line, Rappel, and Cavern Snorkeling. Minimum Height: 1 meter (39 inches tall).